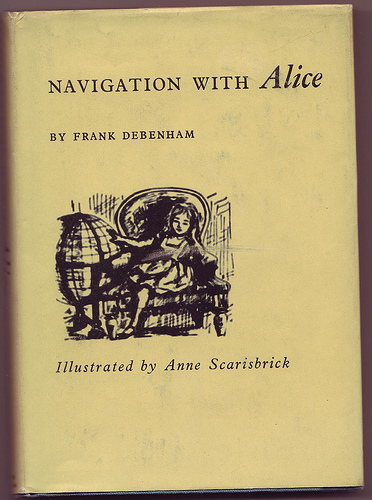 Navigation with Alice by Frank Debenham. Published by Hodder and Stoughton in 1961. Frank Debenham was a Cambridge don, but during World War II he taught navigation to young cadets, and adapted Alice in Wonderland to illustrate the concepts he was trying to get across. The book includes Alice discussing declination and dancing the Latitude Quadrille with the Mock-Turtle, and learning about globes with the Dodo and compasses with the White Knight. It confuses the hell out of me. The illustrations, which are based on the Tenniels, are lovely, especially considering that Anne Scarisbrick was 16 years old when she drew them.